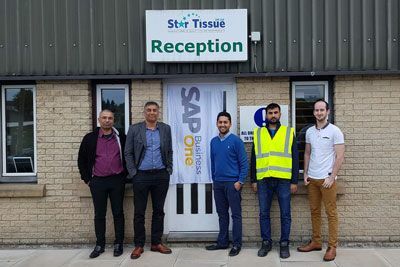 Star Tissue, one of UK’s leading independent manufacturers of hygiene paper products, has gone live with SAP Business One. The SAP HANA database is hosted on SAP Business One as a Service with integrated Add-on Codescan as the warehouse scanning solution. With the addition of Codeless BPA Star Tissue can now automatically create purchase orders for transport costs, together with the Boyum Usability Pack Add-on for SAP Business One which enables pallet calculations based on weight and volume. Prior to implementing SAP Business One, disparate systems and repetitive processes were creating a number of efficiency challenges for Star Tissue and business growth was a real issue. Codestone worked collaboratively with Star Tissue to deliver a business management solution that will enable it to integrate and automate its business functions, optimise production efficiencies and provide a platform for growth.